This entry was posted on Thursday, May 2nd, 2013 at 8:40 pm and is filed under Curious cattle. You can follow any responses to this entry through the RSS 2.0 feed. You can leave a response, or trackback from your own site. 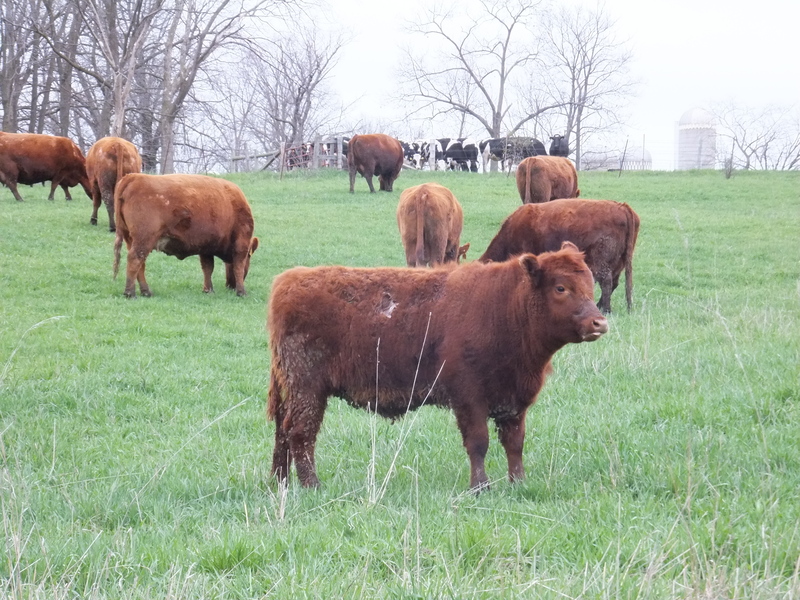 Looks like your fall calves and cows made it through winter looking pretty good. Thanks, Gordon. That’s a consolation for how much valuable hay they ate. You sound like a behavioral psychologist, Matthew! Amazing to look at your March picture and your May picture and see the change in the ground. Make sure you shut the gate. Hey Curious, what happened with your self-weaning calf experiment? I’m curious about the results. Thanks for asking for a follow-up. Sometimes I forget what I’ve written. What happened is nothing specific, which is how a lot of experiments turn out it seems. The 4 heifer calves continued to nurse occasionally all summer. It really didn’t seem to affect the next year’s calves when they were born and the cows switched all their allegiance to the new baby, but I have a vague feeling it was not good for the cows’ udders to be turned on all the time and may have contributed to one old cow’s development of a malfunctioning udder which resulted in me taking a two-day-old calf away from her before it starved and making it a bottle calf. If I would have had a better way to catch the cow I would have tried to nurse the calf and the cow, but their are no catch facilities at this pasture. I really need to have problem-free cattle at this pasture. So, to sum up, if I had to leave the calves with the cows to self-wean I would, but if I can wean, I will. I am letting the calves nurse for 8 to 9 months and weaning onto May pasture so they do very well and the cows get fat on May-June pasture as well.